In my recent post on what developers want, I wrote about which industries appeal to software developers. 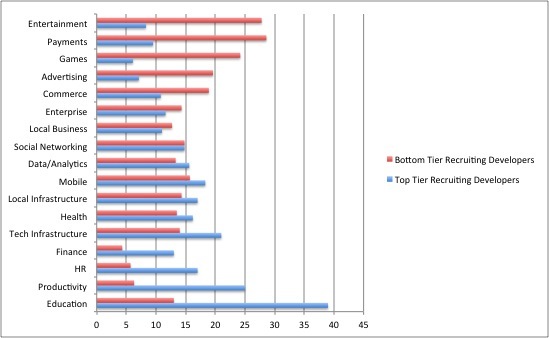 The three areas at the top of developers’ lists are education, productivity, and human resources. 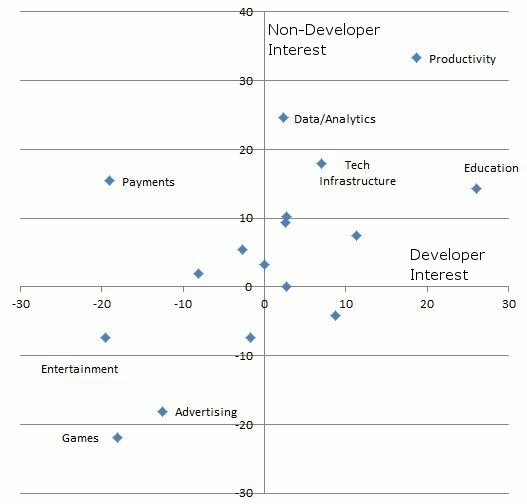 The three areas least interesting to developers are entertainment, payments, and games. It was a question I found interesting. After four-plus years as a developer-founder (aka CTO), I’ve seen a bit of the other side via 500 Startups (where I help companies with data/growth), AngelList (great for understanding the venture ecosystem), and as an occasional individual angel investor. My gut instinct is straightforward: developers and investors don’t seem to have much in common. Hence I thought Jeremy was likely right, but I wasn’t sure I’d be able to show it definitively. AngelList is a terrific data source, but it hasn’t been around for very long. As a result, the number of companies who have used it to both fundraise and hire is limited. Fortunately, it’s comparatively easy to look at the fundraising success of companies within each industry to uncover trends. Breaking things down into industry categories, I could look at companies’ average level of fundraising success. Because I didn’t want to overweight the importance of a few companies who raised a ton of money, I defined a set of fundraising steps a company could achieve. The lowest step consists only of raising non-zero capital; the highest step is raising a round of $5 million or more. I didn’t go higher than $5 million, because the percentage of companies raising that amount of money is tiny. I only looked at investments that have taken place since 2010. The X-axis denotes the mean number of fundraising steps taken by companies in the given industry (more steps means more money). The top three categories favored by investors are Payments, Tech Infrastructure, and Education. Popular as it may be among investors, Payments is among the worst industries for recruiting engineers. Education and Tech Infrastructure, on the other hand, have it all: both do well at attracting developers. The bottom three categories for investment are Productivity, Local Infrastructure, and Local Business. Productivity is among the most popular industries with developers, but does a lot less well with VCs. Local Business and Local Infrastructure are both in the middle of the pack with developers. There are three major outliers: Productivity (developers love, investors hate), Education (both love), and Payments (developers hate, investors love). There are no categories hated by both developers and entrepreneurs. Developers want to build something useful and societally valuable. All things being equal, VCs may feel the same way. However, money usually chases returns, and that means that collectively, VCs are going to as well. Thus it stands to reason that VCs would likely behave in a more economically rational manner than the world of (depending on your perspective) naive and/or altruistic developers. 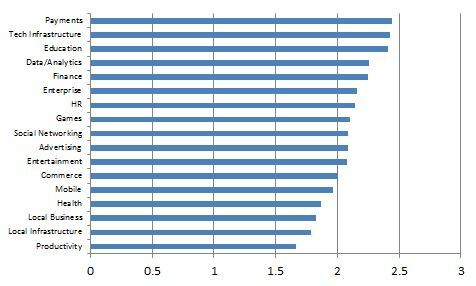 What about developers relative to other potential employees? 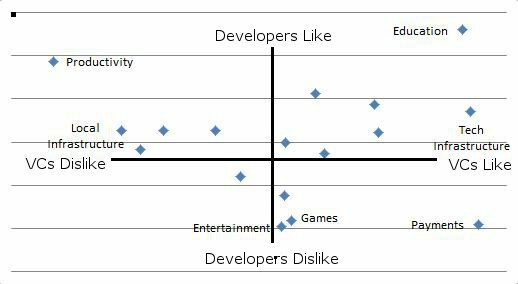 Let’s look at the same type of graph, with developer interest on the X axis and non-developer interest on the Y axis. There’s an extremely high correlation (0.59) between a developer’s excitement about an industry and that of a non-developer. Productivity is the favorite industry of non-developers; it’s the second favorite industry of developers. Education is the favorite industry of developers; it’s well above average among non-developers. Games, Advertising, and Entertainment all fare poorly among both groups. There’s only one major difference in this set: Payments. Developers generally dislike Payments companies, while Payments companies rate highly among non-developers. Investors and employees tend to be driven by different factors. At least in startup-land, developers and non-developers are far more similar than they are different. Everyone loves Education (but it’s really hard to build an Education company). Non-devs and investors like Payments; developers don’t. Employees have soured on Games, Entertainment, and Advertising, even while investors have put a lot of money into those industries. Non-developers and VCs are more excited about data and analytics than developers are, but all three are positive about the field. Non-developers love Productivity companies and developers like them; VCs are much less excited about the industry. Way back when Facebook was a private company, they raised an insane sum of money. They (and a few others) have raised so much that trying to compute any sort of “average” for an industry winds up being an absurd exercise. Thank you, power law! And once again: investors and developers are really, really different.